I attended the Warfare show in Reading a few weeks ago. A great show but I was not inspired on the purchasing front. I’m in a bit of a slump wargaming-wise at the moment – I’m not getting much time to play and don’t have any projects on the go to get the juices flowing. On the plus side I did buy a couple of ‘board’ games at the B&B, and got them on the table when Val and Chris visited this w/e. 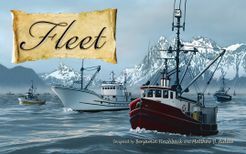 First up was ‘Fleet’, a game themed on Arctic fishing (an unusual theme but it worked OK). This is a card game that involves purchasing fishing licences, launching appropriate vessels and catching fish; all contributing to victory points. The cards are dual-usage (money, vessels and captains) and need to be managed carefully. The licence auction phase is key, but was not as competitive as I expected. We all got up to speed with the rules quickly but understanding strategy takes longer. I think Elaine made some poor choices early and this scuppered her chances. I thought I was ahead but the tally at the end gave Chris a narrow win. I think my mistake was processing fish in the final turn(s) which meant my vessels still had hold space at the end. Anyway I think we all enjoyed the game and it will make further appearances in future sessions. I did also get the expansion box, but I think we will only break this out once we are more familiar with the base game. 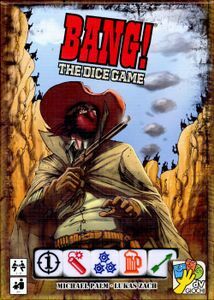 The second game I bought was ‘BANG! The Dice Game’, a western themed, yatzee-style, take-that game. Light, fast and great fun. We played the 4-person version (obviously! ), but I think more players would add to the experience, especially with ‘Deputy’ characters added. The individual character cards with their special abilities are a core feature and add flavour. From reading the rules I thought the ‘Sheriff’ player would struggle, but he came through OK in our games, winning 2 out of 3. I now think the ‘Renegade’ is toughest; aiming to be the last man standing and killing the ‘Sheriff’ last. 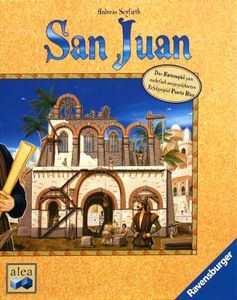 We finished this session with a game of ‘San Juan’, the card version of ‘Puerto Rico’. This is a classic card game that pushes players nicely. There can be some luck in the card draws (I just could not get any production facilities early on) but overall you feel you are making meaningful choices and there are many different routes to victory. The speed of play is good, there is very little AP as players choose their role each turn and all players can carry out the action simultaneously.